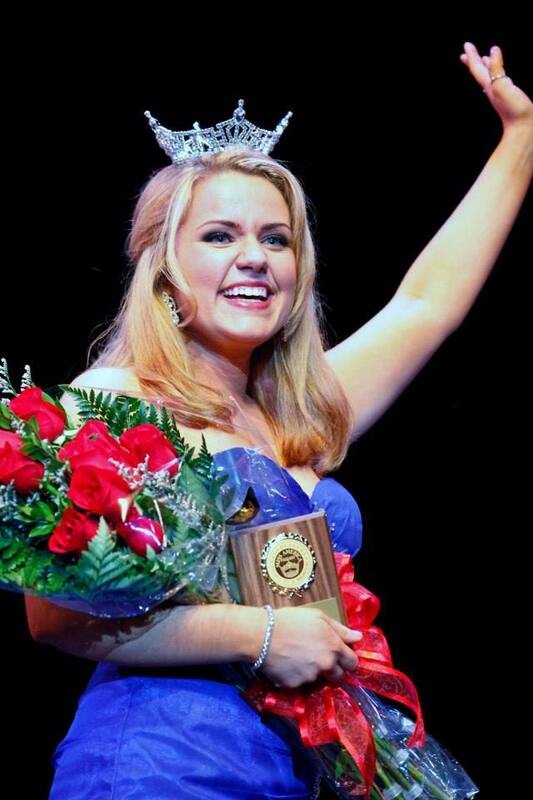 2013 Miss Sonoma County Ashley Kimball resides in Rohnert Park and is a 21 year old senior at Sonoma State University majoring in theater arts with a minor in music. Ashley plans on obtaining a teaching credential with an emphasis on music education. She is also an accomplished violinist and has been studying violin for 16 years. Ashley founded a local children’s non-profit theater company here in Sonoma County. Ashley plans to play her violin at our meeting. President Peggy announced that we’d forgo the usual recognitions in order to make sure that there was ample time for today’s Public Safety Awards presentations. Elizabeth Karbousky started things off by by leading us in the Pledges of Allegiance. The Invocation was presented by Ryan Thomas, representing the Four-Way Test Committee. Ryan shared his personal interpretation of the fourth question: “Is it BENEFICIAL to all concerned?”, explaining his feeling that it basically means operating one’s business in an honest and ethical way as a road to success. He then led us in a short prayer of thanks. The only visiting Rotarian today was a former member of our club, Dan Erickson from the Healdsburg Sunrise Club. Welcome back, Dan! Today’s guests included Terri Abramson, hosted by Jim Johnson. Ken Kelly was the guest of Yale Abrams. Kim Murphy hosted Holly Garretson and Jodi Guntle was the guest of Matt Fannin. Other guests were Past Mayor and current city council member Ernesto Olivares, City Attorney Caroline Fowler, and Bart Eddy. SRPD Award Recipient, Officer Brandon Matthies and his wife Tarryn. Other officer family members in attendance were: Kathy Buchholz, mother * Darryl Caldwell, father-in-law* Debbie Caldwell, mother-in-law* Alicia Matthies, Sister * Chris Matthies, brother (SRFD) *Mike Matthies, father *Christine Smircich, father’s girlfriend * Brad Caldwell, brother-in-law * Joe Peterson, brother-in-law (Cal-Fire) * Caleb Petersen, nephew * Nolan Petersen, nephew. Police Department Attendees included: Lance Badger, Lieutenant * Carrie Behler, Admin Secretary * David Boettger, Sergeant * John Cregan, Sergeant * Ray Navarro, Lieutenant * John Noland, Lieutenant * Craig Schwartz, Captain * Marcus Sprague, Sergeant. Fire Department Award Recipient Captain Keith Flood and his wife Wendy. Also in attendance were: Tony Gossner, Interim Fire Chief and his wife Chris * Interim Deputy Chief Bill Shubin * Battalion Chief Mark Basque * Division Chief of Training Ken Sebastiani * Training Captain Sage Howell * Training Captain Scott Westrope * Interim Fire Marshall Mark pedroia * Administrative Servfice Officer Leff Brown * and Administrative Analyst Jill Scott. 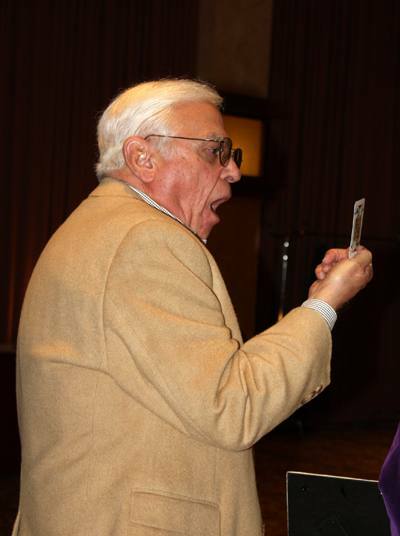 Fred Levin is shocked at the card he drew! The raffle just grows and grows, but eventually someone HAS to win it, right? Well, it didn’t happen today! With a purse of nearly $1,700 and two jokers out of about 16 cards, Diane Moresi was STILL unable to give away more than $10! This must have killed Fred Levin who had the winning ticket. Better luck next week, Fred. There IS a joker in that deck, isn’t there, Diane? Bill Hatcher presented several club members with donor pins acknowledging their ongoing financial contribution achievements to our local foundation. Steve Olsen was recognized for donating over $5,000. Others receiving pins were: Mark Burchill, Judith Glenn, Larry Miyano, Debra Smith Dorfman, Bob Sorenson, Will Haymaker and Eileen Carlisle. Ted Wilmsen reminded us to return any extra dictionaries and folders. 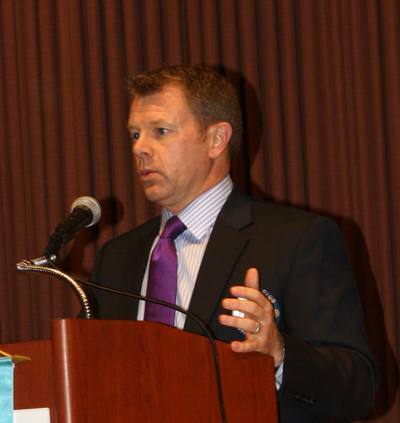 Dave Brown invited Rotarians to get in on the Super Bowl numbers game he is running, which is extremely legal and shouldn’t raise the awareness of any law enforcement officers in the room……..just sayin’. Doug Johnson gave us his weekly pep talk promoting the 2014 Giro Bello fundraiser. Remember, this is our big fundraiser for the year and will only be successful if ALL our members participate in some meaningful way. Our goal is 1,000 riders. Registration opened Monday and we have 50 riders already signed up. Off to a great start! Past President Marnie Goldschlag introduced us to the people behind the badges and reminded us that each was a human being with feelings, fears and families. 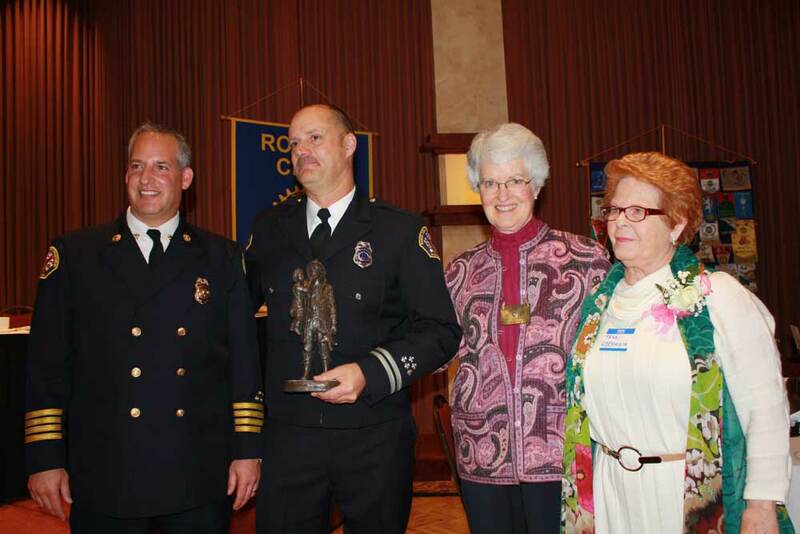 Interim Fire Chief Tony Gossner told us a bit about the Firefighter of the year, Captain Keith Flood. Cpt. Flood has undergone many, many hours of training and has gone above and beyond in service both to his local community and profession. He is a hazmat specialist and has helped develop training media. Because of his expertise, he has been assigned as a wild land fire observer. He recently spent 3 weeks at the Rim Fire, the fourth largest wild land fire ever experienced in California. His duties involved strategizing and directing the firefighters on duty to fight the blaze. Captain Flood is also a member of the FEMA support team, a high honor. 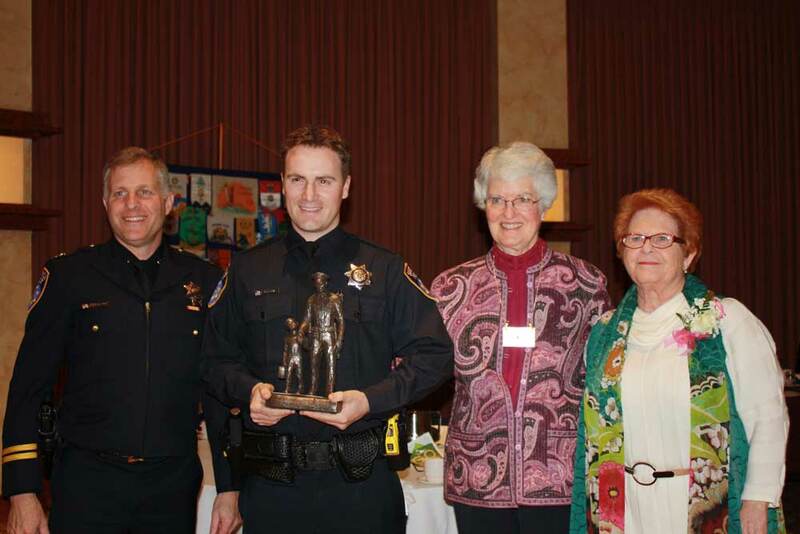 Brandon Matthies was today’s honoree from the SRPD. Officer Matthies was introduced by Captain Craig Schwartz and recognized for his overall professionalism. Capt. Schwartz noted that Officer Matthies was instrumental in resolving a shooting case that was the result of a domestic disturbance in Fountaingrove in October. As the first responder to the situation, Officer Matthies, at great risk to his own life, was able to get the shooter’s wife to safety and directed officers who arrived later in their approach to the scene. Officer Matthies controlled the situation for several hours until the SWAT Team arrived on scene. The families of the first responders, it should be noted, are a tight knit community. It was obvious as Marnie worked the room introducing our club members to the police officers and firefighters that a special bond exists that extends to their families who frequently sacrifice holidays so that their loved ones can serve their community. It should be remembered that theirs is a dangerous profession and their families share in the risks of losing a loved one. At the conclusion of the program, Marnie asked for a moment of silence to acknowledge the passing of BART Police Sgt. Tom Smith who was killed in the line of duty on January 21, 2014.